The silhouette of this BMW 8-Series cabriolet is expected to remain relatively elegant. After the coupe, the cabriolet, the BMW 8 Series is announced, with the release of the first images of the self in disguise, in full session of test of resistance to high temperatures. While the new coupe Series 8 was unveiled in June of last year, BMW diffuses the first images of the convertible version. It is, however, still in disguise, because it should not be on the market before the year 2019. 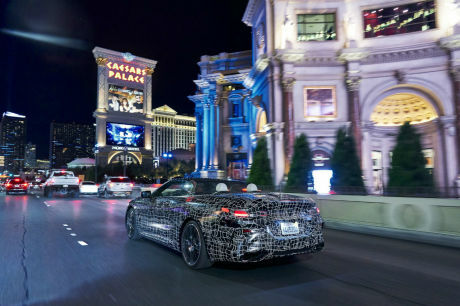 We can thus see the successor to the convertible 6-Series to face the heat and the drought on the roads of the valley of Death in the United States, or even rub the circulation of Las Vegas. If all the models have before their production undergo the tests of resistance to extreme conditions, this step becomes even more important for a cabriolet, since it is necessary to ensure perfect sealing of the soft top, especially to dust. No additional information is given to us on this new cabriolet, that should without a doubt show up the same as the cut on the technical level. It should therefore be launched with the version M850i, equipped with the V8 4.4 twin-turbo 530-hp and all-wheel drive xDrive, as well as with the diesel 840d 320 hp. A sporty variation of the M8, should complete the offer as on the coupe. Yes to a Tempo of 200!